Fact: The Unicorn is the national animal of Scotland. (Sorry, Nessie.) But Scotland's not the only place where those magical horned horses are loved. Find out how unicorn lore spread across the land and captured our hearts with this printable, pocket-sized guide. Based on a popular post on our very own blog, The Goods , it's filled with interesting tidbits about everyone's favorite enchanted equine. Here's another one: The Siberian unicorn was six feet tall and weighed around 9,000 pounds. This miniature book, of course, is much smaller. 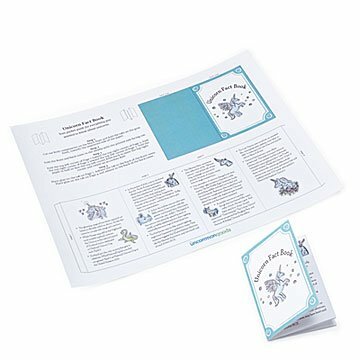 At 2.5" x 3.5" when assembled, you can take it on the go, easily stick one in a unicorn lover's birthday card, or print as many as needed to hand out as fun party favors. Exclusively at UncommonGoods. PDFs formatted for 8.5" x 11" paper.